“We must ensure the participation of indigenous peoples – women and men – in decision-making at all levels. The theme aims to highlight the importance of honouring arrangements between States, their citizens and indigenous peoples that were designed to recognize indigenous peoples’ rights to their lands and establish a framework for living in proximity and entering into economic relationships. Agreements also outline a political vision of different sovereign peoples living together on the same land, according to the principles of friendship, cooperation and peace. A special event at UN Headquarters in New York will be held on Friday, 9 August, starting at 3pm, featuring the UN Secretary-General, the Chairperson of the UN Permanent Forum on Indigenous Issues, a delegate of Panama, a representative of the Office of the UN High Commissioner of Human Rights, and an indigenous representative. The event will be webcast live at webtv.un.org. Also on 9 August, hundreds of indigenous and non-indigenous rowers are scheduled to arrive at Pier 96 at 57th Street in Manhattan at 10am, after having collectively travelled thousands of miles on rivers and horsebacks to honour the first treaty -– the Two Row Wampum -– concluded between Dutch immigrants and the Haudenosaunee (a confederacy of six nations, with capital in the Onondaga nation, in NY State) 400 years ago, in 1613. They will gather with members of the UN Permanent Forum on Indigenous Issues at Dag Hammarskjold Plaza at 1:30pm. Shane Duffy, the Chairperson of the National Aboriginal & Torres Strait Islander Legal Services (NATSILS) delivered a joint statement on behalf NATSILS and the Indigenous Peoples Organisation Network of Australia (IPO) in response to a Study on access to justice in the promotion and protection of the rights of Indigenous Peoples at the Expert Mechanism on the Rights of Indigenous Peoples (EMRIP) at the Sixth Session meeting in Geneva from 8-12 July 2013. Mr Duffy said studies such as these provide a critical point of reference and authoritative guidance for States (National Governments) in their efforts to provide for and implement their obligations concerning the rights of Indigenous Peoples. However, while Mr Duffy agrees that the experience of Indigenous Peoples within the criminal justice system the world over requires urgent action, he said care needs to be taken not to confine States understanding their responsibilities by limiting the expression or scope of these rights to one element or area of concern. He further added; Access to justice for Indigenous Peoples must be about how we can use both Indigenous and Western systems of justice to ensure the greatest possible quality of life for all Indigenous Peoples’, which is highlighted at Article 5 of the Declaration on the Rights of Indigenous Peoples that affirms Indigenous Peoples right to maintain and strengthen our political, legal, economic, social and cultural institutions while retaining our right to also participate fully in the political, economic, social and cultural life of the State. Mr Duffy’s statement called on the Human Rights Council (HRC) to encourage States to implement the United Nations Declaration on the Rights of Indigenous Peoples as the foundational document for the development of all policies concerning Indigenous Peoples, including issues related to access to justice, and that the HRC request the EMRIP extend the Study on access to justice in the promotion an protection of the rights of Indigenous Peoples to include a practical analysis of Articles 1 (4) and 2 (2) of the Convention on the Elimination of All Forms of Racial Discrimination and General Comment XXIII by the CERD as it relates to special measures and the requirement to obtain free, prior and informed consent. Mr Duffy further added ‘it is important that States utilise informed standardised data collections that ensures a more strategic approach that provides appropriate needs based financial resources to Indigenous organisations to build their capacity to respond appropriately to Indigenous justice needs. Mr Duffy said, ‘In Australia, the statistics provide a damning picture, with Aboriginal and Torres Strait Islander adults incarcerated at 15 times the rate of non-Indigenous adults; imprisonment rate for our women has grown by 58.6% between the years 2000 to 2010; Our children are 24 times more likely to be in youth detention than non-Indigenous young people. In 2011-12, our children were subjected to child protection substantiations at a rate of 41.9 per 1000, nearly eight times that of non-Indigenous children. They are also ten times more likely to be in out-of-home care (comprising 31% of all children in care), despite making up only 4.2% of the population of all children and young people. In addition to the rising rates, our children are increasingly being placed with non-Indigenous foster carers. We have therefore called on the Australian government to take into consideration the significant issues highlighted in the full intervention to work collaboratively with us to facilitate the restoration and strengthening of local governance and decision-making structures to improve Aboriginal and Torres Strait Islander people’s access to justice’. 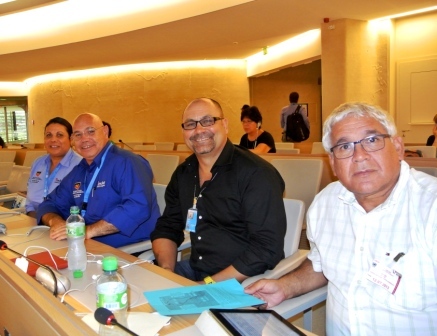 Indigenous organisations from Australia are in Geneva as part of the Human Rights Council’s 6th Session of the Expert Mechanism on the Rights of Indigenous Peoples (EMRIP). 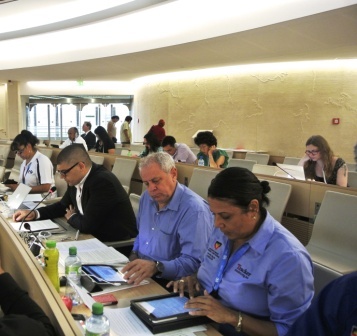 The 6th Session of EMRIP is being held from 8-12 July 2013 where the focus is on studies regarding access to justice, the World Conference on Indigenous Peoples and progress on the implementation of the United Nations Declaration on the Rights of Indigenous Peoples. The Indigenous People’s Organisation (IPO) Network of Australia is a broad affiliation of Aboriginal and Torres Strait Islander organisations and individuals, who engage with the Human Rights Council and other United Nations mechanisms and frameworks to advocate for the implementation of the Declaration. Co-chairs at the Expert Mechanism, Brian Wyatt and Dea Thiele, assist in coordinating the activities with the Aboriginal and Torres Strait Islander community organisations that make up the IPO attending this year’s Expert Mechanism. Discussion will take place on the status of recommendations around previous thematic studies which health, culture and education as well as this year’s agenda item on access to justice in the promotion and protection of the rights of Indigenous Peoples. Indigenous organisation delegates that make up the IPO at this year’s Expert Mechanism include the National Native Title Council, Aboriginal Medical Service of Western Sydney, New South Wales Aboriginal Land Council, National Aboriginal and Torres Strait Islander Legal Services, National Aboriginal and Torres Strait Islander Women’s Alliance and the Aboriginal and Torres Strait Islander Social Justice Commissioner. According to Mr Wyatt, ‘this year’s Expert Mechanism acknowledged significant input from the National Native Title Council, in their report on a survey questionnaire seeking views of States and Indigenous Peoples on best practices regarding possible appropriate measures and implementation strategies to attain the goals of the United Nations Declaration on the Rights of Indigenous Peoples’. New South Wales Aboriginal Land Council was also acknowledged by the Expert Mechanism for their detailed report on the Study on Access to Justice for Indigenous Peoples including Truth and Reconciliation Processes. 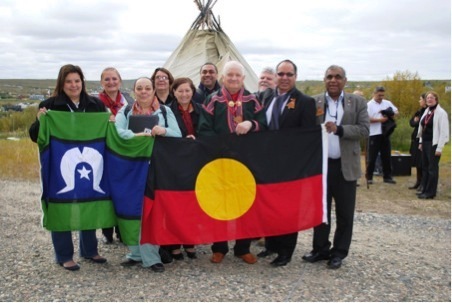 The Indigenous People’s Organisation (IPO) Network Australia recently promoted a global first in the launch of the World Indigenous Nations University which was profiled at the United Nations Permanent Forum on Indigenous Issues (UNPFII) in New York City. The World Indigenous Nations University will be launched by the World Indigenous Nations Higher Education Consortium (WINHEC) in August after a decade of negotiations and consultations with Indigenous Elders, academics and Knowledge Holders from 8 different countries and many different Indigenous nations across the world. IPO Spokesperson and WINHEC Executive Committee member, Professor Boni Robertson said the University would establish an education system that honours and respects Indigenous cultural knowledge and knowledge systems and profile the scholarship of Indigenous Elders and Knowledge holders who work in close collaboration with Indigenous academics to address the needs of Indigenous peoples at the local level. “The World Indigenous Nations University (WINU) programs will be multi modal in delivery, accessible via the internet and face to face to ensure access for local, national and international communities to engage in an education system that is meaningful and relevant to them. “This is an exciting initiative which will further the education and collaboration of Indigenous Peoples in Australia and across the world,” Professor Robertson said. It is also an exciting opportunity for Indigenous and non-Indigenous higher education systems to work collaboratively together to address the educational needs of Indigenous students whilst addressing the needs of communities through collaborative evidentiary research. “The launching of the WINU epitomizes the depth of mobilization that is taking place amongst Indigenous academics, Elders and Knowledge Holders. “The global members of World Indigenous Nations Higher Education Consortium (WINHEC) have worked on the curriculum for the past 11 years in order to allow Indigenous Peoples across the globe access an education system that meets the needs of their own peoples. “Working together we can protect and promote the sovereign rights of Indigenous Peoples to systems of education that embed the scholarship of their cultural knowledge in the development of curriculum and research. “The Pacific region has been specifically influential with Australia, NZ and Hawaii in collaboration with Sami in Norway having had a major influence in the development of this initiative. I am proud that Australia has played such a strong role in the development of the University. Professor Robertson said the establishment of the University will be at the regional and global level and based upon the involvement of local community in the education for and about their own young people. “Involvement of community Elders and representatives will foster other forms of engagement to address the ongoing disparities that have occurred for Indigenous Peoples, within the sector. “It is imperative that western education systems committed to working with Indigenous Peoples at the local level, demonstrate respect for the cultural rights of Indigenous Peoples and profiles and promulgates these rights as determined by the people themselves. The IPO is a broad affiliation of Aboriginal and Torres Strait Islander People’s organisations and individuals, who engage with United Nations mechanisms and frameworks to advocate for the implementation of the Declaration. The overrepresentation of Indigenous Peoples in child protection and criminal justice systems must be the next focus point of those working on Indigenous issues at the international level said a network of Australia’s Indigenous organisations at a United Nations forum in New York this week. Brian Wyatt, Co-Chair of the Indigenous People’s Organisation (IPO) Network Australia said the IPO had made six recommendations to the United Nations Permanent Forum on Indigenous Issues (UNPFII) on the future direction of the Forum. “Across the world, and especially in Australia, there is an appalling overrepresentation of Indigenous Peoples in the criminal justice and child protection systems. This is having devastating effects on Indigenous communities the world over. “We suggest the issues need be studied in tandem because of their clear links. Indigenous children in care and protection often come into contact with the juvenile justice system and then in turn, the adult criminal justice system. “Indigenous children and young people are vastly overrepresented in care and protection systems. In 2011-12, they were subjected to child protection substantiations at a rate of nearly eight times that of non-Indigenous children. “They are also ten times more likely to be in out-of-home care (comprising 31% of all children in care), despite making up only 4.2% of the population of all children and young people. “The statistics regarding contact between Indigenous Peoples and the justice system are also alarming. Our adults are 15 times more likely to be incarcerated and our youth are almost 24 times more likely to be in youth detention. ”We can’t ignore these statistics and let them continue. We have to do everything we can to identify their causes and explore ways to improve the prospects for our young people. “There is a need for improved, standardised and aggregated data collection regarding criminal justice and child protection on a global level, to adequately understand the issues and put attention where it is most needed. The forum is currently wrapping up on the discussion on future work and directions for the rights of Indigenous peoples around the world. The final Report of the Forum was adopted and it was revealed that the theme for next years UNPFII will be Good Governance articles 3, 4, 5, 6 & 47 of the Declaration on the Rights of Indigenous Peoples. The human rights of Indigenous Peoples in Australia and across the world is under the spotlight at the United Nations Permanent Forum on Indigenous Issues (UNPFII) at UN headquarters in New York this week. Brian Wyatt, Co-Chair of the Indigenous People’s Organisation (IPO) Network Australia said many countries were still falling behind in recognising the rights of their Indigenous Peoples. “The Declaration on the Rights of Indigenous Peoples in 2007 by the United Nations General Assembly was a historic milestone in the international struggle by the World’s Indigenous Peoples towards acknowledgment and respect of their rights to development,” Mr Wyatt said. “However we remain concerned that some countries are not doing much more than paying it lip service. Mr Wyatt said the IPO had made two key recommendations to the UNPFII to address these issues. “All countries need to embed human rights training and education into their bureaucracies including regular updates on the rights and standards contained in the Declaration and their relevance at the national and local levels. “We also recommend that each country commit to developing a National Strategy with their Indigenous Peoples to give full effect to the Declaration. “This would ensure the Declaration was used in a practical way to improve the lives of Indigenous Peoples in a meaningful way. The 12th Session of the United Nations Permanent Forum on Indigenous Issues is being held at the United Nations in New York from 20-31 May 2013. The IPO is a broad affiliation of Aboriginal and Torres Strait Islander organisations and individuals, who engage with United Nations mechanisms and frameworks to advocate for the implementation of the Declaration. 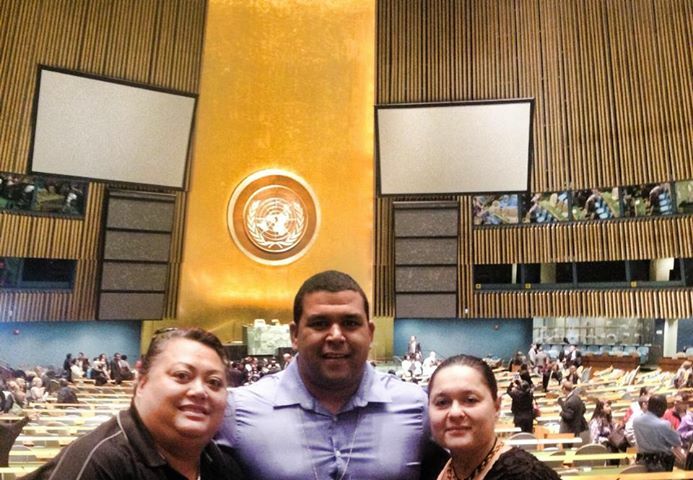 The United Nations Permanent Forum on Indigenous Issues (UNPFII) held at UN headquarters in New York has throughout the duration of the forum focused on areas including previous forum recommendations relating to Aboriginal and Torres Strait Islander Peoples health, education and culture. 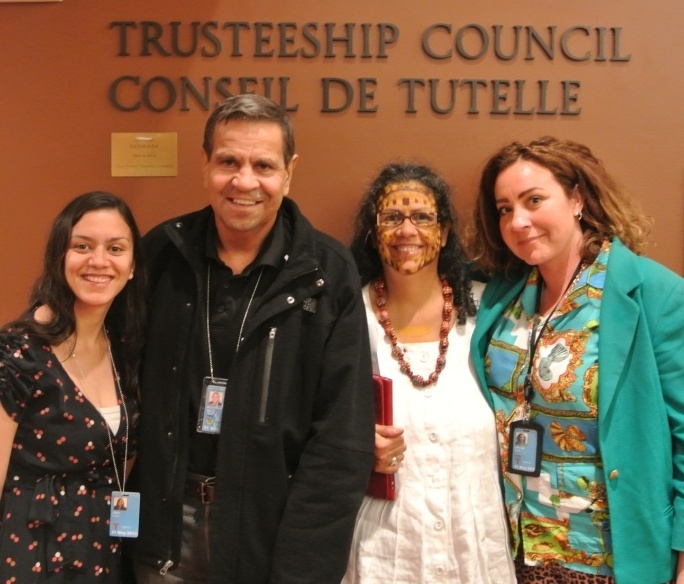 Picture above of Kirsten Gray, Brian Wyatt (co-chair) Tjanara Goreng Goreng (FIRDA- Culture) and Amala Groom (FIRDA – Culture) at the UNPFII. Brian Wyatt, Co-Chair of the Indigenous People’s Organisation (IPO) Network Australia welcomed the opportunity for Australia’s indigenous issues to be raised on the international stage. Mr Wyatt said nine recommendations had been made to the Forum relating to Indigenous health with a strong focus on the need for Indigenous Peoples to have control over health service delivery. “All over the world we see evidence that the biggest improvements in Indigenous health is where those people have control over the services provided to them. “This is because we understand our own communities and their needs and can deliver culturally appropriate care. Australia’s own Aboriginal Community Controlled health sector has been proven to be the most effective in closing the health gap. Mr Wyatt said the IPO had also made an intervention on education, urging members to ensure knowledge and contemporary social circumstances of Indigenous Peoples are embedded in the curricula of education systems. “In the face of global challenges to the self-determining interests of Indigenous Peoples, it is urgent that action be taken by the UN to protect and promote the sovereign rights of Indigenous Peoples to systems of education that embeds the scholarship of their cultural knowledge in the development of curriculum and research. Mr Wyatt said the IPO had also put forward four recommendations in relation to culture acknowledging the need of Indigenous Peoples to retain control over their genetic resources, intellectual property and traditional cultural expressions. First Peoples Disability Network Australia – Foundation for Aboriginal and Islander Research Action (FAIRA) – Foundation for Indigenous Recovery and Development, Australia (FIRDA) – National Aboriginal Cultural Community Health Organisation (NACCHO) – National Congress of Australia’s First People’s – National Aboriginal Torres Strait Islander Legal Services (NATSILS) – National Indigenous Higher Education Network (NIHEN) – National Aboriginal and Torres Strait Islander Women’s Alliance Corporation (NATSIWAC) – National Native Title Council (NNTC) – New South Wales Aboriginal Land Council (NSWALC) – Office of the Social Justice Commissioner. 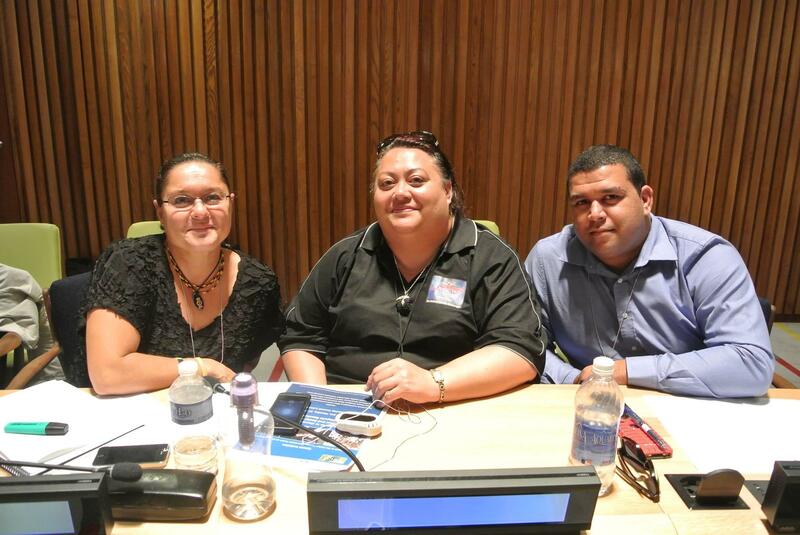 Indigenous organisations from Australia are on the world stage as part of the United Nations Permanent Forum on Indigenous Issues (UNPFII) in New York City, USA. First Peoples Disability Network Australia – Foundation for Aboriginal and Islander Research Action (FAIRA) – Foundation for Indigenous Recovery and Development, Australia (FIRDA) – National Aboriginal Community Controlled Health Organisation (NACCHO) – National Congress of Australia’s First People’s – National Indigenous Higher Education Network (NIHEN) – National Aboriginal and Torres Strait Islander Women’s Alliance Corporation (NATSIWAC) – National Native Title Council (NNTC) – New South Wales Aboriginal Land Council (NSWALC) – Office of the Social Justice Commissioner. The 12th Session of the United Nations Permanent Forum on Indigenous Issues is being held at the United Nations in New York from 20-31 May 2013. As a review year, the focus of the Forum is on previous recommendations, such as progress made towards implementing the UN Declaration on the Rights of Indigenous Peoples and the upcoming World Conference of Indigenous Peoples to be held in New York in 2014. The Indigenous People’s Organisation (IPO) Network is a broad affiliation of Aboriginal and Torres Strait Islander organisations and individuals, who engage with United Nations mechanisms and frameworks to advocate for the implementation of the Declaration. Co-chairs at the Permanent Forum, Brian Wyatt and Sandra Creamer, assist in coordinating the activities with the Aboriginal and Torres Strait Islander community organisations that make up the IPO attending this year’s forum. Discussion will take place on the status of previous recommendations around health, culture and education as well as future work of the Forum where the IPO will be delivering an intervention on justice and child protection. There has also been the opportunity for dialogue with the Special Rapporteur on the Rights of Indigenous Peoples, Professor James Anaya and the Chair of the Expert Mechanism on the Rights of Indigenous Peoples Chief Willie Littlechild where the IPO presented a number of questions relating to the rights of Indigenous Peoples and a range of issues including health, culture, impact of the mining boom in Australia on Indigenous peoples and their communities. According to Mr. Wyatt, this year’s Forum is a “unique opportunity for Indigenous peoples from around the world to assess the past work of the Permanent Forum and review UN Member States progress with the implementation of the Declaration on the Rights of Indigenous Peoples”. Representatives of NACCHO the national authority on Australian Indigenous health have joined more than 2,000 indigenous people from around the world who are in New York City for the twelfth session of the United Nations Permanent Forum on Indigenous Issues, May 20 to May 31 at the UN Headquarters where they will discuss culture, education and health. Deputy Chair Matthew Cooke, CEO Lisa Briggs and Public Health Medical Officer Professor Ngiare Brown said NACCHO will be presenting a number of recommendations on Indigenous health in a Joint Intervention on behalf of the Indigenous Peoples Organisation (IPO) network of Australia. “We will be emphasizing to the forum that Indigenous primary health care must be driven at the community level and access must be available. The lack of health related data is of concern as it is needed to enable developing, informing and shaping health policies that are evidence based. More needs to be done in this area. Mr Cooke said from the first day’s youth report NACCHO was very concerned to hear from expert health panel member that Australian Indigenous youth suicide rates are amongst the highest compared to others. International Indigenous youth suicide rates are reaching above 10%. “According to the latest research, nearly one-third of Aboriginal and Torres Strait Islander adults report high to very high levels of psychological distress in their lives – two and a half times the rate reported by other Australians. NACCHO believes that the mental health and social and emotional wellbeing of Aboriginal peoples and Torres Strait Islanders should be given greater priority in the nation’s health policy agenda. “This is a real challenge for us as we are well aware that Indigenous peoples are still lagging behind in terms of access to basic services such as health and education and Indigenous peoples’ culture is not respected by the wider society unless it is about luring the tourist dollars. We are aware that indigenous peoples throughout the world — whether they live in developed or developing countries continue to die from preventable diseases. 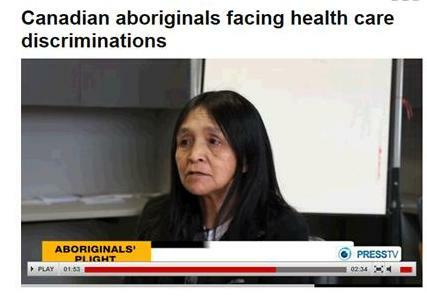 In fact, it almost seems there is a real lack of understanding of indigenous people’s vision of health. That member agencies of the Inter-Agency Support Group on Indigenous Peoples Issues work with the UNPFII and delegates to promote special intra-country reports on priority health issues – for example, child health, men’s health, mental health, youth suicide, chronic disease. Indigenous organisations from all over Australia gather to be heard on the world stage as part of the United Nations Permanent Forum on Indigenous Issues (UNPFII) in New York City, USA. The 12th session of the Permanent Forum is being held at the United Nations headquarters in New York from 20-31 May 2013. As a review year, the focus of the Forum will be on previous recommendations, such as progress made towards implementing the UN Declaration on the Rights of Indigenous Peoples and the upcoming World Conference of Indigenous Peoples to be held in New York in 2014. The Indigenous People’s Organisation (IPO) Network is a broad affiliation of Aboriginal and Torres Strait Islander organisations and individuals, who engage with United Nations mechanisms and frameworks that negotiate, design and develop international standards on Indigenous rights. The IPO welcomes Kanyinke Sena as chairperson for this forum. IPO Co-chair Brian Wyatt and acting Co Chair Sandra Creamer will assist in coordinating the work of a wide variety of Aboriginal and Torres Strait Islander community organisations attending this year’s forum. Discussion will also take place on the status of previous recommendations around health, culture and education as well as future priorities and work of the Forum. However, there will also be an opportunity for dialogue between Indigenous peoples and both the Special Rapporteur on the rights of Indigenous Peoples, James Anaya and the Chair of the Expert Mechanism on the Rights of Indigenous Peoples Chief Willie Littlechild as well as interactive dialogue between Indigenous People’s and UN agencies. The attendance of Mr Anaya will offer an opportunity for Indigenous People’s to discuss ongoing challenges and human rights violations. 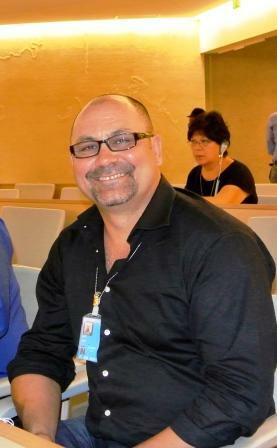 According to Co-chair Brian Wyatt, this years Forum is a “unique opportunity for Indigenous peoples from around the world to assess the impact of past recommendations, particularly around the implementation of the Declaration as well as engage in honest dialogue with the Special Rapporteur on the distinct challenges facing Aboriginal and Torres Strait Islander peoples”. Dr. Dawn Martin-Hill is a Mohawk of the Wolf Clan, holds a PhD in cultural anthropology, lives on Six Nations and is one of the founders of the indigenous studies program at McMaster University. Improving the health of Aboriginal children requires teaching them about their traditional languages and culture, says anthropologist Dawn Martin-Hill. Martin-Hill was speaking to an indigenous children’s health symposium put on by university medical students Saturday at McMaster Innovation Park. Its purpose was to examine why the quality of health of aboriginal children is so much worse than other young Canadians — and to consider solutions. Ongoing and systemic racism within the medical profession was a major reason raised. So too was a deep distrust of doctors by Aboriginals, something passed down through generations that stems from trauma at their hands in residential schools, or in practices such as sterilizing native women, Martin-Hill said. And yet there was a time in history when the colonizers relied on aboriginal medicines, ways and traditions to survive, Martin-Hill pointed out. Children and youth make up more than 48 per cent of Canada’s aboriginal population. They suffer from higher rates of infant mortality, poverty, diabetes, tuberculosis and fetal alcohol syndrome than non-aboriginal children and lag in access to health care. A 2009 UNICEF report on children ranked Canada third out of 177 countries in prosperity and welfare, but if the First Nations communities were considered on their own, the ranking slips to 68th. Martin-Hill is a Mohawk of the Wolf Clan, holds a PhD in cultural anthropology, lives on Six Nations and is one of the founders of the indigenous studies program at McMaster University. Martin-Hill said the natives of Akwesasne territory have been the most proactive at restorative health so far by using traditional methods of intervention, bringing back rituals “to reseed our identity” and the rights of passage into manhood and womanhood where family and community lends support in much the way “a village” raises a child. It’s about teaching children empowerment through traditional methods, she said. Through research and study, Martin-Hill said, it has become clear that native language is the primary protective factor of children’s health. “I know it’s hard to fathom,” she said, adding that the B.C. interior communities able to keep their languages and traditions due to their remote locations, far from agents and missionaries, fared best in children’s health. Martin-Hill said there are no biological reasons for suicides and diabetes being higher in aboriginal children — other than the historical trauma that has made its way through the generations, including children being torn from their homes and sent to residential schools. What can the Australian Aboriginal controlled health movement learn from the Canadian experience? The facts are outlined in a 74-page document titled “empathy, dignity and respect,” The Health Council of Canada released it not too long ago and what it is shows is Aboriginal Canadians face racism and stereotyping when it comes to obtaining health care all throughout the country. Pamela Shauk heads The Native Friendship Centre of Montreal, a non-profit helping to improve he life in the Urban Aboriginal community of Montreal. But even so doubt looms among Aboriginals and other Canadians. The report was based on meetings with health care providers across the country, many of whom were aboriginal.The Health Council of Canada says when Aboriginal patients arrive whether it’s in an emergency room or in any health centre — they’re not necessarily seen for who they are and consequently not respected, and are not treated as fellow human beings. Because of it, Aboriginal patients are now avoiding care or drop out of treatment programs.The situation is all the more concerning because aboriginal people often have poorer health and shorter life expectancies than other Canadians. According to the report, while factors like poverty and the impact of colonization are known to have an impact on Aboriginal health, a “Western approach to health care” seems to be reinforcing stereotypes, alienating and intimidating patients.